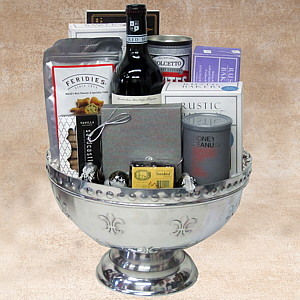 The gorgeous embossed silver urn will get attention the moment it comes through the door. Then the fun starts. Inside, we've put a brilliant Domaine D'Aupilhac Rouge wine along with Sweet Shop Chocolates, Honey Peanuts, Rustic Bakery Blue Cheese Crackers, Dolcetto Cookies, Lindor Truffles, Sandcastle cookies, the absolutely astounding Rustic Bakery Cacao Nib Bars, Feridies 5 O'Clock Crunch snack mix, Monte Carlo Wafer Cookies and Sugarbush Fram Hickory Maple Smoked Cheese. A Silver Service par excellance.